At Ria Family Dental, we have a multiple restorative dentistry options for your dental needs. 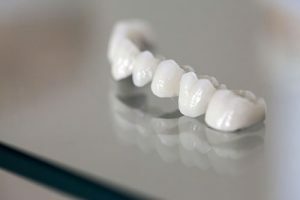 Among these, dental crowns and bridges are two of the most popular options. Not only do they replace missing teeth, they also improve the teeth’s aesthetics. Read on to learn more about crowns and bridges. Dental crowns are fixed dental restorations. They “cap” a damaged tooth to protect it from further damage and restore its other functions. They are constructed from materials that are not only durable but also have the look and feel of natural teeth. They can effectively participate in heavy chewing and with proper care, can last a long time. A dental bridge, just like dental crowns, is a fixed dental restoration. Its function is to replace multiple missing teeth. The false teeth bridge one natural tooth to another. The natural teeth on either side serve as the anchor for the false teeth. Dental bridges are also made of materials that have the look and feel of natural teeth. They are recommended for those who still have natural teeth left. If there are no existing teeth, the next option is a denture. Nowadays, missing teeth can easily be replaced. Dental crowns and bridges are just two of the multiple restorative dentistry options at Ria Family Dental. Talk to us today!